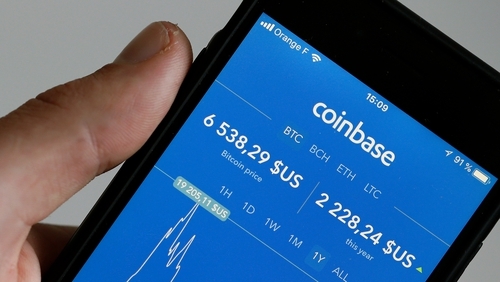 Cryptocurrency exchange Coinbase has opened an office in Dublin, joining the growing ranks of banks and financial firms with major British businesses developing European Union outposts as Brexit looms. San Francisco-based Coinbase, one of the biggest US exchanges, said the Dublin office would let it keep rights to sell services in EU countries even after Brexit. Its non-US headquarters will remain in London, it added. Cryptocurrencies are largely unregulated in Europe, but Coinbase is licensed to provide fiat currency-related services across 23 EU countries. Many customers deposit fiat money - currency that a government has declared to be legal tender - at Coinbase before buying and selling cryptocurrencies. The company's UK chief executive Zeeshan Feroz said the Dublin office would also aid Coinbase's expansion in Europe, its fastest growing area this year by new active customers. "It ticks a lot of boxes - ranging from giving us a contingency, helping us plan for all eventualities for Brexit and engaging with Europe through another base," he told Reuters. Unsure of Britain's future relations with the EU, banks are scrambling to strengthen or open offices in the bloc - though most have said London would almost certainly remain their main European hub irrespective of Brexit. The Bank of England estimates 5,000 financial services jobs will have left for continental Europe by the time Britain quits the EU in March. Still, as few as 630 UK-based finance jobs have been shifted or created overseas, a Reuters survey last month found. Feroz would not give details of the size of the Dublin office. The website of Coinbase, which employs over 500 people worldwide, shows seven open business and customer support-related positions in Dublin. Like other exchanges, Coinbase grew rapidly last year as the price of bitcoin, the most well-known cryptocurrency, rocketed more than 1,300% to a record high of almost $20,000. Turnover at Coinbase's UK arm, which serves non-US clients, soared last year to €128m from €1.9m a year earlier, a filing with corporate records keeper Companies House showed, with 71% generated outside Britain. But the price of bitcoin has slumped this year - it was trading on Monday at around $6,400 - pushing trading volumes down and likely hurting exchanges. Research firm Diar said Coinbase's US dollar volumes slumped 80% from the fourth quarter of 2017 to the third quarter of 2018. Coinbase declined to comment on the report.